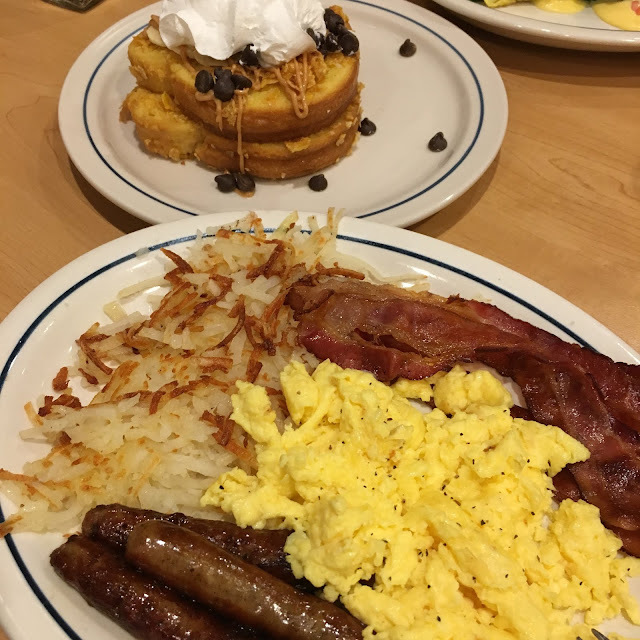 IHOP is a classic breakfast spot where you can always count on a nice serving of good, hearty comfort food. And I love that every few months there's something new to try. 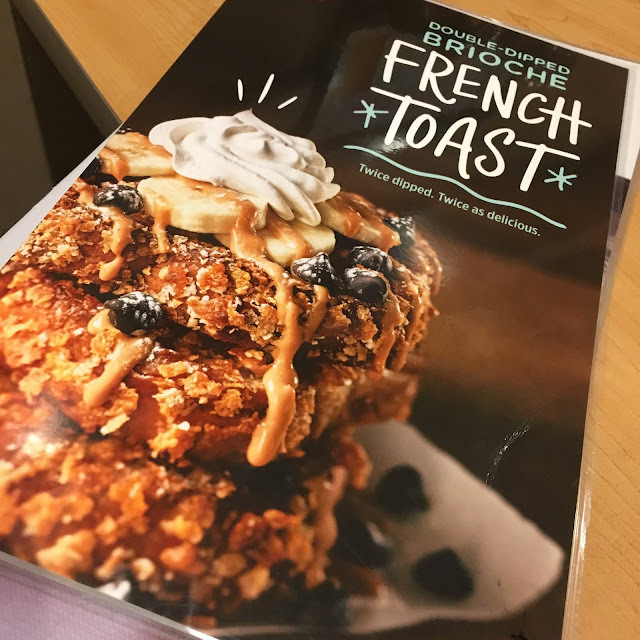 The current promotion is the Double-Dipped French Toast ~ yummy sweet brioche french toast coated in corn flakes and oatmeal in two yummy flavors. The Blackberry & Vanilla or Banana Peanut Butter & Chocolate varieties can be enjoyed all day long at IHOP locations through April 10. 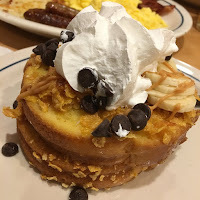 I paid a recent visit to IHOP with my husband where I tried out the Banana Peanut Butter & Chocolate version, which was really sweet and delicious. It almost qualifies as dessert in my book and makes me hesitant to enjoy it as meal in itself - but, I was pleased to see that it comes in a variety of combo meals. So, for a dollar or two more you can add eggs, meat and hash browns. I had forgotten what a great deal it is to eat there. With my Double-Dipped French Toast, I opted for a combo that was $7.99 and included eggs, bacon, sausage and hash brown. Now that's a big breakfast. It actually made two meals for me as I could barely finish half and the rest went home for lunch later that afternoon. I had some of the eggs, sausage and hash browns and then one slice of the French toast as my "dessert." 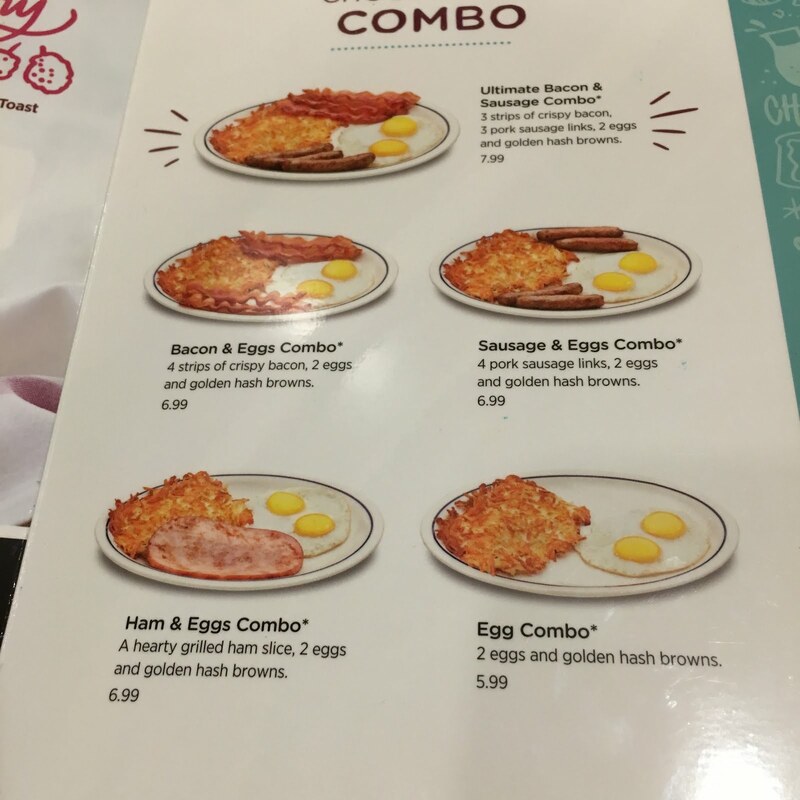 It's really one of the most reasonable places in my area for breakfast - or if you're like me and believe breakfast is good any time of day, it's a good choice for a reasonably priced lunch or dinner. "Double-Dipped French Toast became an immediate fan favorite when we introduced it last summer, so it was a natural choice to come back to the menu in two fresh, new flavors, “ said Marie Grimm, Vice President, Menu Development and Innovation, International House of Pancakes, LLC. “The combination of the unique texture of our Double Dipped French Toast with these exciting new ingredients will create even more fans of this terrific treat, perfect for breakfast all day or night!" Don't miss out on this limited time menu item because once it's gone you don't know when you'll have the chance again! **I did receive a complimentary meal for the purpose of a review. I was not compensated for this post. All opinions are my own.